I’m always looking for fun family games that everyone from my youngest to my oldest will enjoy because one of my family’s favorite activities is family game night. On family game night, we turn off the tech, set work and school aside, and focus solely on doing something fun together as a family. Usually, we choose a fun indoor game. Faster than you realize, the kids will be grown and your opportunities to do things together will be limited. So, if you don’t already have a family game night tradition, it’s a great time to start! There are plenty of board games you can buy that the whole family will enjoy. 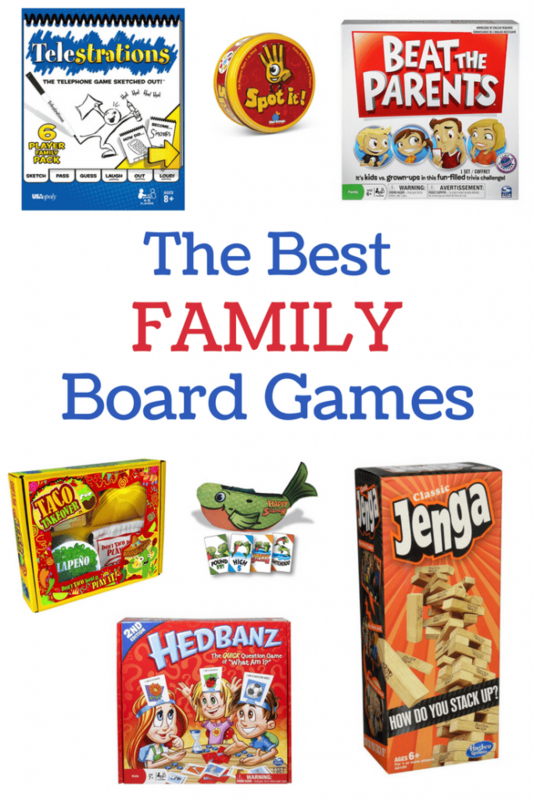 For example, check out my family’s picks for the Best Family Board Games. You don’t have to buy a board game to enjoy family game night though. Instead, you can make your own! 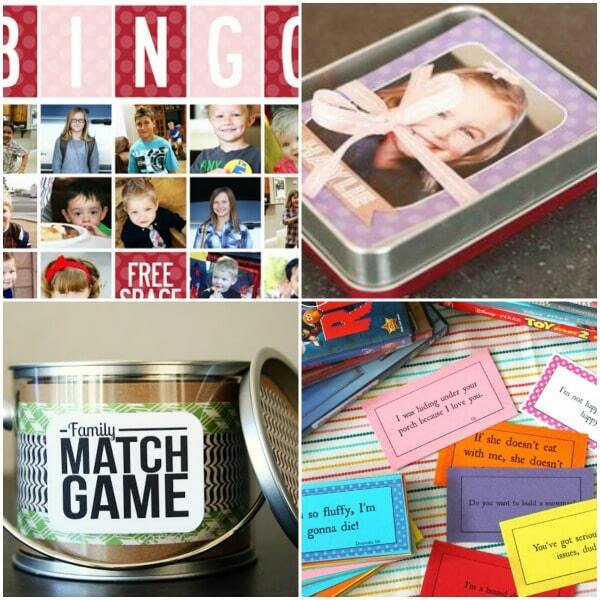 If you are looking to make lasting memories as a family, DIY family games are perfect. Here are some DIY game ideas for family fun night to get you started. Below I’ve listed 20 different DIY games (with links to instructions) for family game night. There’s a wide variety so no matter what types of activities your family enjoys, you’ll definitely find one you will all enjoy! Disney Pictionary – You just need paper, something to write with and lists of Disney movies and/or characters (free printable lists included in the post). Disney Charades – Just print the free cards available in the post and you have everything you need for a fun game of charades Disney fans will love! Disney Quotes Game – Another free printable. Divide the family into teams and see which team can match Disney quotes with the movies they came from the fastest. Too Big, Too Small, Just Right Game – This is a game you can play anywhere with just paper and a pen, pencil or crayon. Fun for all ages and educational too! Palace Card Game – Even though we play a lot of card games, this one was new to me. Golf Card Game – If you have two decks of cards and at least two players, you have everything you need for this fun family card game. Bingo – Everyone knows how to play Bingo. Just print these free cards and you’re ready to play! Family Face Bingo Cards – Bingo is even more fun when the spaces are familiar faces! Free template included in the post. Family Photo Go Fish – Another fun way to personalize your family games. Step-by-step instructions in the post to make your own family photo cards. Family Matching Game – This is a sweet way to remember your relatives who don’t live closer. As a military family, I wish I’d seen this idea when my kids were younger! Family Yahtzee – This one is a true DIY. You’ll have to do some wood cutting, but the end result is so much more fun than traditional Yahtzee. Frisbee Tic Tac Toe – There are plenty of ideas in this post, but this super simple large tic tac toe board is my favorite! Life Size Game – Another game that will get you off the couch. You’re going to love this life sized board game! The Flour Game – This is remarkably simple but oh so funny at the end. You just need a plate, flour, a lifesaver and a butter knife. Classification Game – This one is so easy and so much fun! You just need paper, writing utensils and a timer. Marble Roll Game – Grab an empty box and some marbles and you’re ready to play. Save the Kids Game – This one is messy but fun to play and even funnier to watch! 20 Questions Game – This isn’t the traditional 20 questions game. It combines the traditional game with Headbandz. Family Friendly Bunco – Bunco is a fast game and since it’s simple, everyone in the family can play. You just need dice and the score cards (included in the post). Family Minute to Win it Games – Minute to Win It Games are my favorites for parties, but they also make for extra fun family game nights! Whether you already enjoy family game night or are just eager to start this tradition, here are more ideas to help you have tons of fun as a family. If you’d prefer to buy a board game rather than create your own, check out this list of the best family board games. If your family loves technology, there are plenty of ways to put your smartphones and/or tablets to work as a family bonding tool. 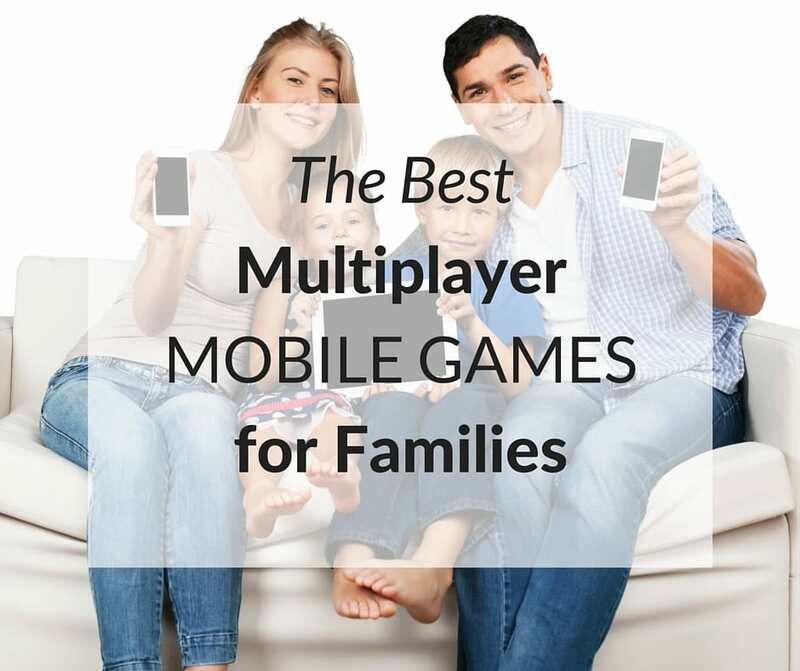 Check out these multiplayer mobile games that are great for family game night. Prefer to get outside with the family? 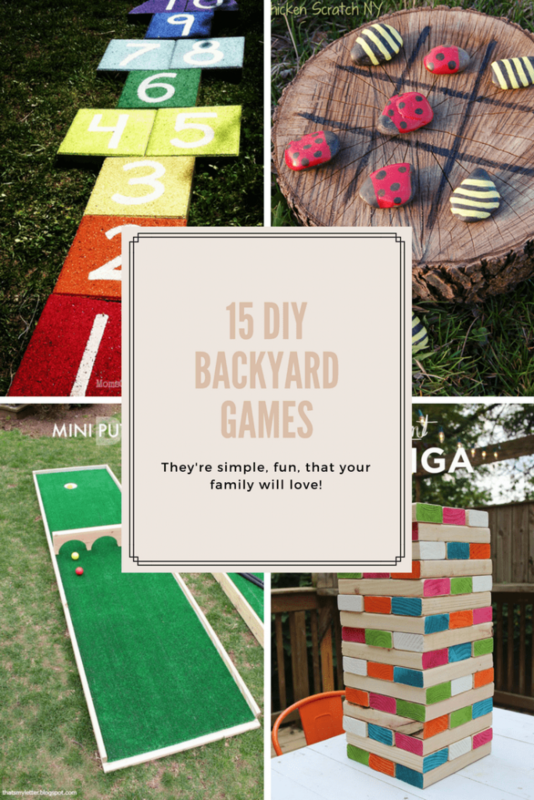 Then you’ll love these DIY backyard games! 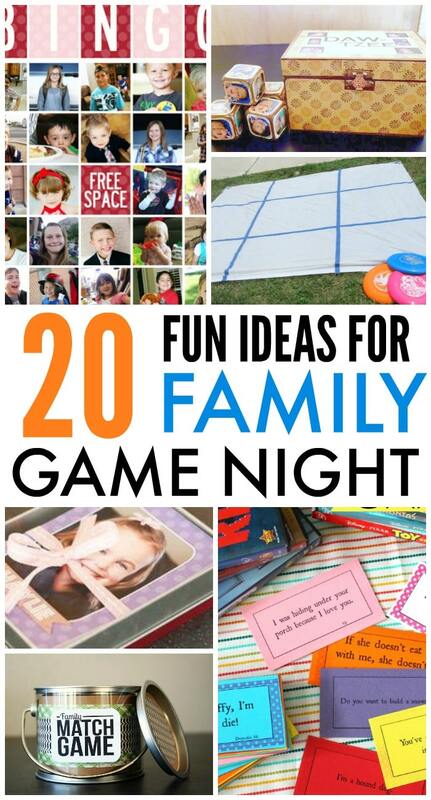 I hope you’ve found plenty of inspiration for your family game nights! If you have other ideas or suggestions, please share them in the comments. I love this post! And your logo! Cuteness overload. I couldn’t find a way to subscribe to your blog on mobile. Help! Hi Lizzy, thanks so much! I love the name of your blog! So, complete oversight not having a subscription box on every post. Here’s the link to sign up and I’m adding it now so that it will show up on every post so other readers don’t have the same problem. Thank you for bringing it to my attention! I’m hosting a family game day consisting kids as well as adults. I want the games to flow and not boring especially for the men who want to play cards and checkers. so, looking for suggestions, so har I like blind musical chairs and bingo. suggestions would be greatly appreciated. With so many kids at home, my husband and I are realizing we are spending less and less time altogether because of our busy schedules. I totally agree with this article that having a family night can spark up some new family traditions! It seems to me like the more time you make for your family, the easier it will be for everyone to get along. I’ll be sure to share this information with my husband.